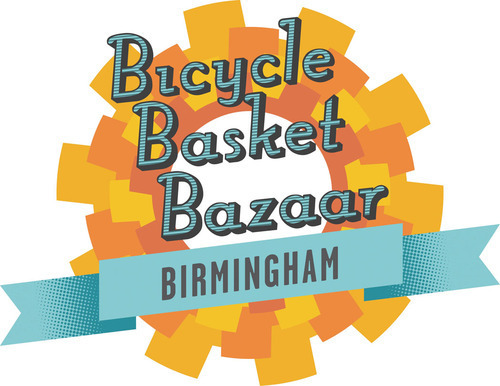 Next week (Saturday 9th August) Eye Candy joins up with POD Projects to present the fabulousBicycle Basket Bazaar at Summer in Southside. The Bicycle Basket Bazaar project, run by Trevor Pitt of POD Projects, involves a unique array of retailers each presenting their art and wares into bike-baskets, panniers and around their cycles: kind of like an art fair meets car boot sale, but more compact and kinder to the environment. 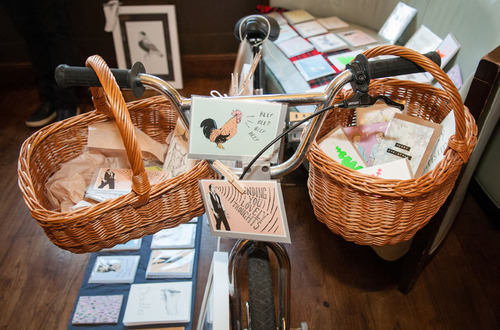 In essence, BBB is a celebration of the bicycles, creativity and good cheer. With 12 specially selected artists, illustrators and makers we’re taking over the courtyard at the National Trust’s Back to Backs on Hurst Street and Inge Street (next to the Birmingham Hippodrome) in Southside to present this unique art fair on two wheels which will see artists ‘pimping’ their bikes to sell from. Part of Birmingham Hippodrome’s festival of outdoor summer events during August the focus of the day is all about showcasing talent from the West Midlands region, including people who studied here or have strong links. Suitcase Sounds – The striking retro suitcases that have been turned in to a piece of modern audio speakers that you can plug your phone straight in to. 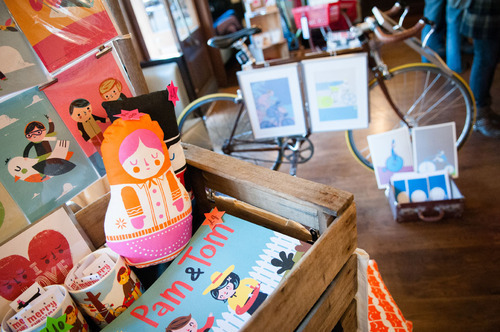 Ben Javens – The remarkable character work of Ben has seen him commissioned by brands across the globe. Sonny Ross – A recent graduate of BCU Sonny has a unique style and creates wonderful prints and comic books. Ed J Brown – Regularly commissioned by publications Ed’s distinctive work can be seen in Wrap to Reader’s Digest. Working Clasp – Stunning asymmetric and bespoke laser-cut jewellery design made out of their Custard Factory studio. Column Arts Agency – Representing some of the regions best talent Column’s Will Astbury will be displaying the best his artists have to offer. Lizz Lunney – Comic Illustrator Liz’s quirky and fun characters are brought to life in her mini comic collections. Lov Li – Beautiful cards and wraps. Ken Hurd – Stunning land and cityscape watercolours. Eye Candy – A selection of prints and works from some of our past Eye Candy artists. Come along to pick up a unique gift, check out some great work and see the Bazaar in action. This edition of BBB has been co-produced with Eye Candy Festival. This entry was posted in Art, Birmingham, Festivals and tagged Art in Birmingham, Bicycle Basket Bazaar, Birmingham, Eye Candy, POD Projects, Southside, Summer in Southside. Bookmark the permalink.